Market participants will be gearing up for the unofficial start to earnings season in the week ahead, while a slew of economic releases and Federal Reserve speeches flood the calendar. Investors' focus will likely be on the health of the U.S. financial sector, with J.P. Morgan Chase, PNC Financial Services and Wells Fargo each set to announce earnings. However, in the run-up to the big banks’ earnings, retail giant Bed Bath & Beyond is slated to unveil its Q4'FY18 financials, when retail sales figures ultimately signaled doom-and-gloom. In its Q3’FY18 filing in early January 2019, Bed Bath & Beyond said it was “ahead of plan with respect to its longer-term financial goals." Investors will likely be focusing on the health of the U.S. financial sector, with J.P. Morgan Chase (NYSE: JPM), PNC Financial Services (NYSE: PNC) and Wells Fargo (NYSE: WFC) each set to announce its latest quarterly results. However, in the run-up to the big banks’ earnings, retail giant Bed Bath & Beyond (NASDAQ: BBBY) is slated Wednesday to unveil its fourth quarter of 2018 financials, when retail sales figures had ultimately descended into doom and gloom territory. The New Jersey-headquartered company has been facing increasing pressure from activists Legion Partners Asset Management, Macellum Advisors and Ancora Advisors, who recently submitted 16 nominees to fully take over the firm’s board of directors. Bed Bath & Beyond said in late March that it had “met with and held several discussions with Legion and Macellum over the past few weeks,” however despite repeated requests for their suggestions on improving the company's business, none were forthcoming. The actions follow a dive in the company’s stock of more than 49% from April 2018 to late December. In intraday trading ahead of the weekend, shares remained roughly 12.3% away from their latest 52-week high at about US$18.12, according to the IBKR Trader Workstation (TWS). The fall in the firm’s shares had been accompanied in October 2018 by a fourth downgrade from Standard & Poor’s since January 2016. S&P’s ratings on the company had gradually slipped down the investment-grade credit quality ladder over that period until eventually being thrown into junk status. To date, Bed Bath & Beyond is rated ‘BB+’ by S&P, while maintaining a high-grade ranking of ‘Baa3’ by Moody’s Investors Service. However, Moody’s had also cut its credit rating one notch in mid-October 2018 from ‘Baa2’. Moody's analyst Peggy Holloway said the downgrade reflected a pick-up in the decline of its Q2’FY18 gross margin, marked by higher coupon expense, lower merchandise margin and rising direct to customer shipping expense. 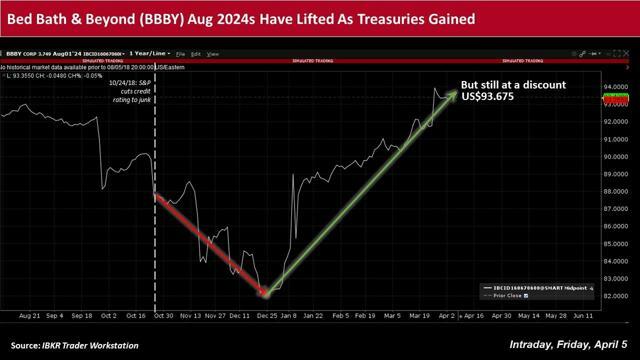 In turn, the effects would spur leverage to remain above 3.0x and EBIT/interest to drop to around 3.0x. She continued that “slightly negative same store sales trends” had exacerbated the impact of margin pressure. 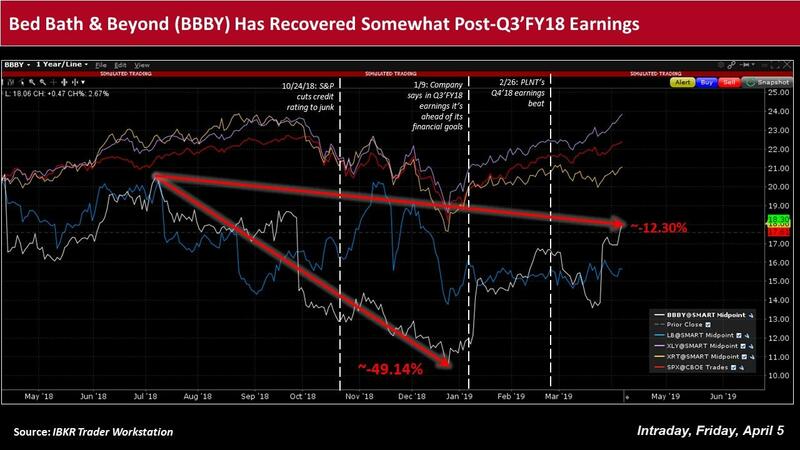 Moody’s added that Bed Bath & Beyond is “constrained by our expectation that both competitive pressures and above average expenses (to support key initiatives) will continue to negatively impact operating margins. In its Q3’FY18 filing in early January 2019, Bed Bath & Beyond said it was “ahead of plan with respect to its longer-term financial goals to moderate the declines in its operating profit and net earnings, this year and next.” The firm also said it was on track to grow net earnings by 2020, and based on its preliminary assumptions, believes that its fiscal 2019 net earnings will be about the same as its prior fiscal year. Shareholders had generally celebrated the news, with Bed Bath & Beyond's stock having skyrocketed around 20% on the day. Among its Q3’FY18 results, the company reported net earnings of US$0.18 per share, or US$24.4m, down from US$0.44 EPS, or US$61.3m, in the same year-ago quarter. Net sales over the same period had risen by around 2.6% to roughly US$3.0bn, while comparable sales fell about 1.8%. The market typically expects the retailer to earn a little more than US$1.10 EPS in Q4’FY18 compared to its actual US$1.48 EPS in the prior year’s quarter. Bed Bath & Beyond’s Q4’FY18 earnings are set for release against a backdrop of several economic reports, which should provide more insights into the consumer landscape, as well as the financial sector, as the next earnings season gets underway. At the Institute of International Finance Washington Policy Summit, Washington, D.C. Note: This material was originally published on IBKR Traders' Insight on April 5, 2019.